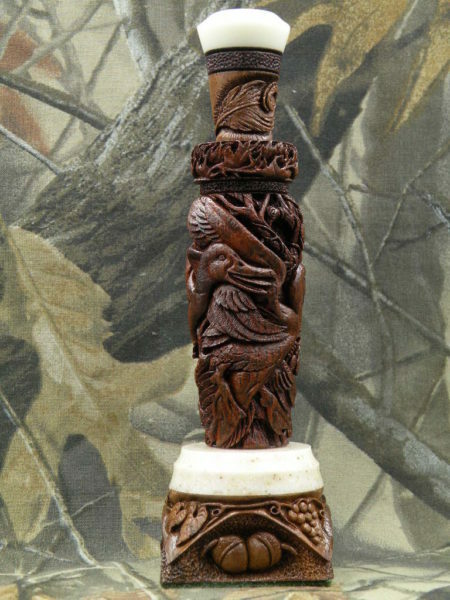 Exotic Hand Carved Cocobola Duck Call - SOLD - Heritage Calls, Inc. THE CALL: An equisite hand carved exotic cocobola wood duck call by famed call maker and artist, Joe Bucher. This fabulous call is carved with remarkable detail, amazing relief undercuts and stunning accuracy with regards to nature. Incredible detail is showcased in this old tree structure with its remaining fall leaves and the winding and crawling of frost grape vines. Great skill is used to create pass through carved undercuts of the vines and tree limbs. The grape vines themselves are native to the hardwood bottomlands of eastern Arkansas and are here showcased. With great skill and exteme detail the tiny grapes still intact on the vines surrounded by their remaining fall leaves. A mallard pair arriving on a cold north wind finds shelter here in these flooded hardwood timbers provided by the state of Arkansas. Gliding down in the timber, a drake sports a leg band ..jewelry.. the old hen quacks with excitement. A rather worn sign on the old tree indicates the exact location of their arrival. The band area of this call, usually in brass is painstakingly carved with worn twisted pin oak leaves. This call is a tribute to the great state of Arkansas and tribute is paid in the finely detail carving of its stand consisting of pin oak leaves, acorns and of course…rice! A topping of ivory acrylic on the insert only showcases the drake curl feather and oak leaf directly below. A truely investment, one of a kind call for the collector, you will marvel at it for years upon years to come!